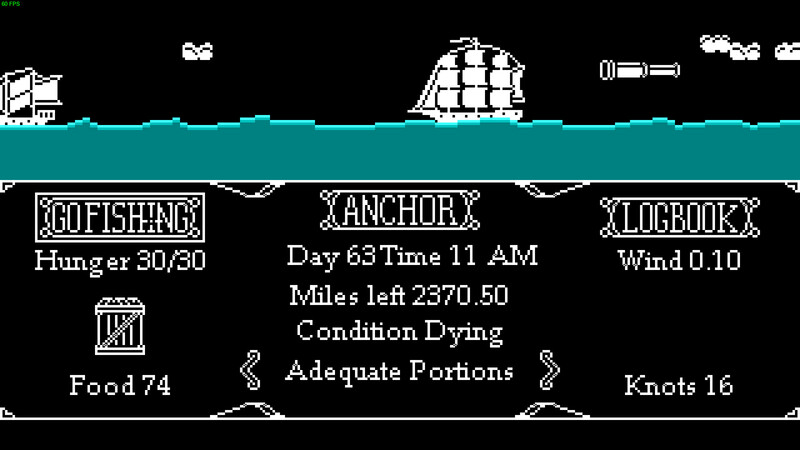 At first blush, a lot of The Caribbean Sail almost seems like concepts transplanted and then transformed from the classic game, The Oregon Trail. Sure, everything is now nautical but much of the same charm and sensibilities (not to mention aesthetics) are clearly meant to evoke parallels with that adventure. Set in the 18th century, The Caribbean Sail has you fill the role of the captain of a ship with the premise that great riches await those who sail and make it all the way to far-off Nassau. 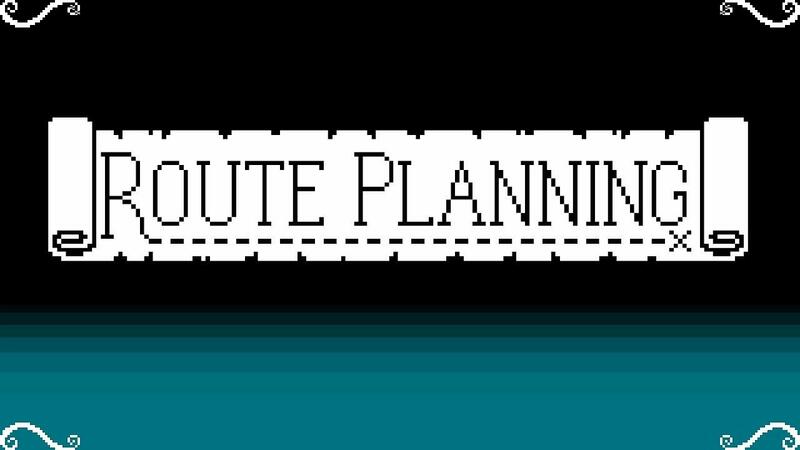 Though the Caribbean port of Nassau might seem like the final target, much like Oregon is in Oregon Trail, the game turns out to be a far more open and non-linear affair than that. In reality, you’re free to sail about to different ports, amassing wealth and improving your ship as you go along. In the course of your adventures you can become a commissioned privateer, a pirate, or get caught up in the global conflicts of the time. This is one of the strongest parts of the game and there’s mechanics such as being able to change up your flag and fool enemies or friends that are fun little details that allow you really play as you like. Every time a port is reached, players receive experience which can unlock new ship types, captain types and other assorted awards. As your captain becomes more experienced, you may upgrade a few skills in order to improve your chances of surviving long journeys out at sea. I think the game mostly strikes the right balance between simplistic and engaging when it comes to these systems and there’s a lot of replayability found in trying out different combinations or simply sailing around to different ports without a specific goal in mind. Some of the minigame segments, like fishing or fighting battles, can be a little too simplistic and repetitive due to the amount of times you have to do them. They’re not very challenging but screwing up in them can have disastrous consequences without, conversely, giving you that much feeling of accomplishment. Clicking the mouse to launch a harpoon at the right moment becomes almost second nature eventually but it still doesn’t excuse the dozens of clicks you have to do on a long journey in order to have enough food for your crew. I know the retro look is polarizing to many gamers but if you’re into that sort of thing, it’s clear that the game paid a lot of attention to the details of it all. 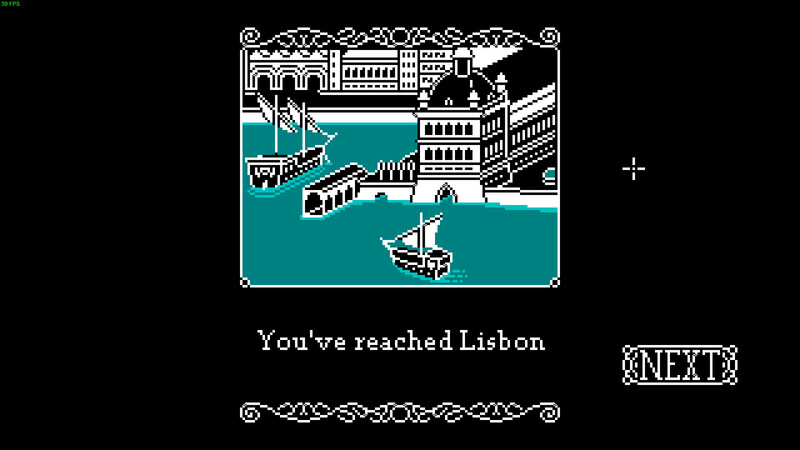 The various midi-like sea shanties you can collect and play, the flags, art of the ports and other things all feel very much right and fit right in with that aesthetic from begone eras. Likewise, care went into the small things like having Portuguese man o’ wars appear in the Central Atlantic or Narwhals in the waters around Iceland. There’s a lot to find and to enjoy in the game and it’s likely impossible to experience it all in a single session. You can expect to run into the occasional wreck, flotsam or reef as you’re sailing along. Or you may find yourself dealing with mutineers or debating whether or not to saw off a wounded limb on a crewmember after battle. Even something like figuring out how to best use the special items you can pick up at ports or trade for with other ships is something that'll take you a while. The bits of cheeky humor sprinkled in here and there help matters and, more importantly, struck the right chord with me. My only criticism in regards to these events and random discoveries is that I wish that there was more of them, perhaps occurring more frequently. Some parts of each game, especially after you’ve aligned with a faction, can feel a little cookie cutter with much of the gameplay boiling down to sailing to a specific port in order to try to find a specific ship to sink. So having a little more variety aside from spotting another ship and choosing to engage it or not could have helped break up some of the unintentional tedium. 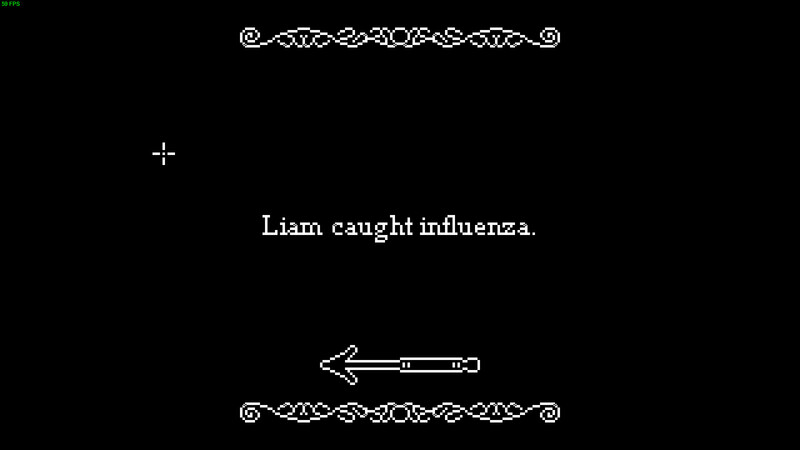 All in all, I had fun exploring the vast oceans and (usually) dying a terrible death at the hands of a powerful warship or due to infection. It certainly respects the spirit of The Oregon Trail while not being exactly beholden to the formula and is all the more fun because of it. If you’re into the idea of an open-ended adventure and don’t mind just a little drudgery now and again, then this is an easy title to recommend. I can definitely see myself coming back to this every now and again and trying my luck once more. You can find The Caribbean Sail on Steam. I was introduced to this game early on, and have watched it grow. I find it to be quite a nice little gem, and continue going back to it for more when that casual urge strikes me. Thank you for covering The Caribbean Sail! It's been a battle to make the world eventful without becoming obnoxious since conception. With more planned content updates I hope to continue fighting back the tedium. That recommended fix for running the game on systems with Mesa drivers may help out a couple users on the forums! You can fix the GameMaker Studio games with amd+mesa using R600_DEBUG=mono. Victorian_Clambake Thank you for covering The Caribbean Sail! Just purchased your game on Steam. Every nautical + pirate game gets my attention, so you got me there! Looks like fun! The combat reminds me of playing the first Worms way back when. Wishlisted.